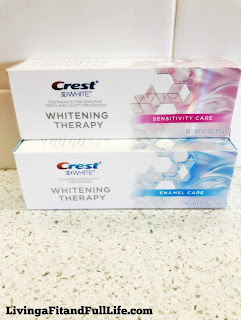 Living a Fit and Full Life: Take Back Your Oral Health with Crest's New 3D White Whitening Therapy Enamel Care & Sensitivity Care Toothpastes! Take Back Your Oral Health with Crest's New 3D White Whitening Therapy Enamel Care & Sensitivity Care Toothpastes! Whiten your smile while experiencing the relief from sensitivity you’ve always wanted. 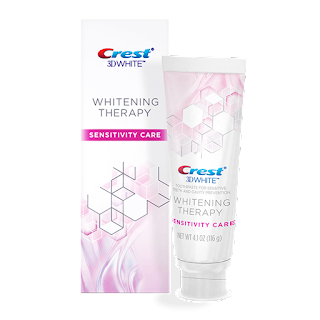 Introducing new Crest 3D White Whitening Therapy Sensitivity Care toothpaste. Our gentle whitening ingredients work to lift surface stains to reveal the bright, white smile you can expect from Crest 3D White. The added benefit? While you brush, our formula envelops and remineralizes your weakened teeth, and relieves sensitivity pain. Pamper your teeth with the therapy treatment, for a dazzling, white smile. Take back your oral health with Crest's New 3D White Whitening Therapy Enamel Care & Sensitivity Care Toothpastes! 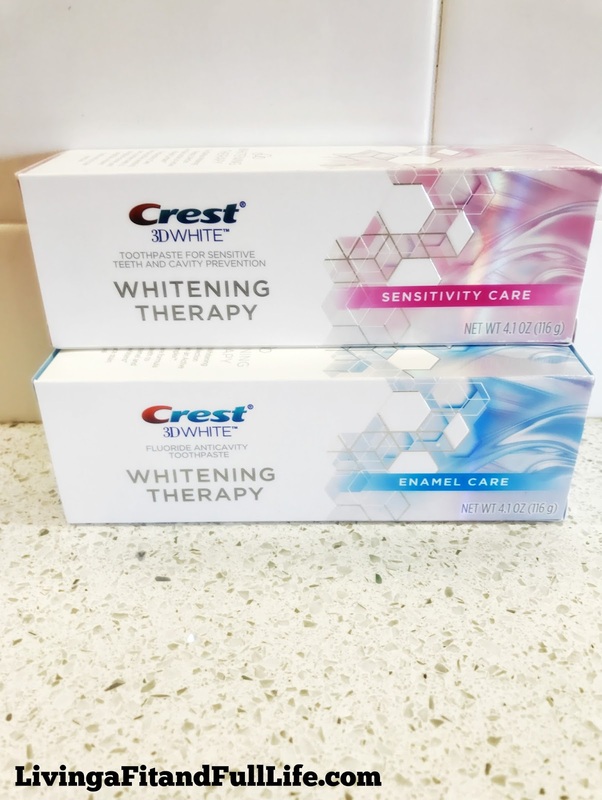 Crest's New 3D White Whitening Therapy Enamel Care & Sensitivity Care Toothpastes are like no other toothpastes on the market. Crest's 3D White Whitening Therapy Sensitivity Care toothpaste works to remineralize your weakened teeth, all while relieving sensitivity pain. If you're like me and have sensitive teeth but still want a healthy white smile then this is the toothpaste you've been dreaming of. My teeth are far less sensitive than ever before and I've already noticed my teeth are at least a shade whiter. Crest 3D White’s NEW Whitening Therapy Enamel Care toothpaste is perfect for those who want strong healthy white teeth. My husband absolutely loves this toothpaste and I've noticed his breath smells better than ever and his teeth look whiter than ever. Crest's New 3D White Whitening Therapy Enamel Care & Sensitivity Care Toothpastes are just what you need to reclaim your oral health!